Find and compare the best prices from a range of well known car rental companies at Palma de Mallorca Airport. This is a free to use facility, enabeling you to book direct with the company quoting the price. 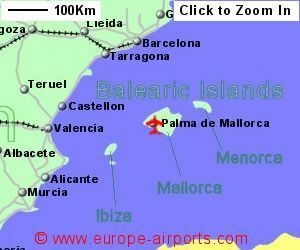 Palma de Mallorca Airport, otherwise known as Airport, is located 8Km East of Palma, the capital of the Balearic island of Mallorca, in the South East of the island. 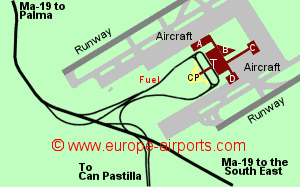 The airport has one main terminal building with 4 modules leading from it - Module A, B,C and D.
The airport is situated close to the motorway linking it to Palma and beyond, with no part of the island being more than 60Km away. Bus to Palma each 15 minutes during daytime approximately 3 Euros. Taxi into Palma should cost approximately 20 Euros. Facilities include 33 bars/cafes/restaurants, 31 shops, currency exchange, 7 ATM's, 2 VIP lounges, free WiFi Internet access, a post office, conference room, childrens room, and WiFi Internet access. Palma de Mallorca airport has Airport Carbon Accreditation, at the Reduction level. Passenger numbers totalled 27,9 million in 2017 (making it the third busiest airport in Spain), representing a 6% increase from the previous year.